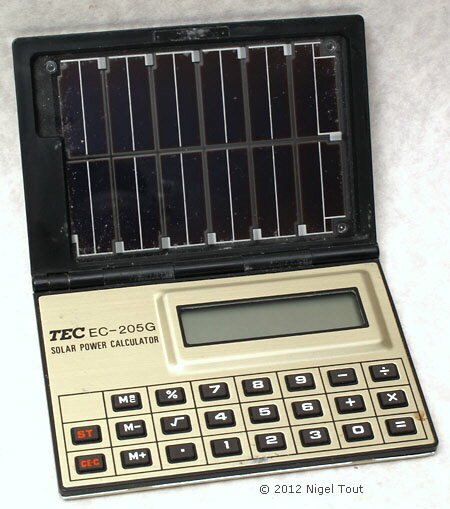 There were several models of folding calculators that used a similar large solar cell. Shown here are the Sharp EL-825, the TEC EC-205G, the ADLER SOLAR-MINI and the IMPERIAL SOLAR-MINI. Distinctive features: An early solar cell powered calculator. When folded it has the same footprint as a credit card. Display is 8 digits, LCD. 4-function, %, memory, square root. Large fold up solar cell. Folded 98 x 68 x 12 mm (3.9" x 2.7" x 0.5"). Open 98 x 132 x 6 mm (3.9" x 5.2" x 0.3"). Size of solar cell 76 x 50 mm (3" x 2"). When folded the calculator has the same footprint as a credit card. Here the calculator has been opened up. It is interesting to see that there are two cut-outs to accommodate button cells in the circuit board (where the wires from the solar cell module connects), and there is printing to indicate which way round the cells should be inserted (too feint to show up here). 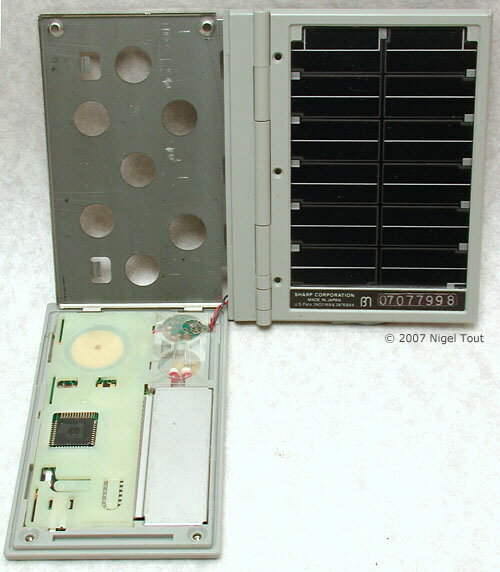 This shows that this model is a conversion to solar power from a calculator designed for button cells. The two small red components are actually LEDs, here functioning as voltage-limiters to prevent too high a voltage being applied to the electronics if a very bright light falls on the solar cell. This model is a bit of an enigma since there is little information about it and the solar cell is large for the year of introduction, since there had been development of more efficient cells. Perhaps, if you want to add a solar cell to a credit-card sized calculator and need to make it a folding type, then you might as well use a cell which takes up the whole of the side for maximum sensitivity. The folding design and the photocell are the same as that of an early Teal model (the Photon III), but the keys and display are different. The year when the EL-825 was introduced is given as 1981, though there is an advertisement for it in Popular Science in 1980. Also, from observation of examples of this model appearing on the auction site eBay, it may have just been sold in part of the U.S.A. If you have any further information about this please get in touch with us. 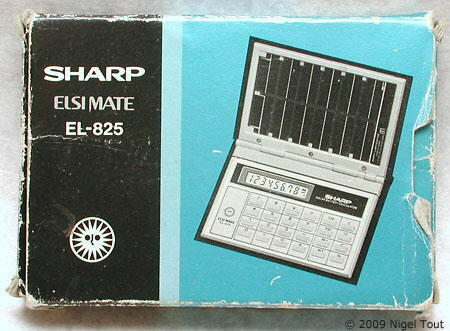 In 1976 Sharp had introduced the first calculator equipped with solar cells, the EL-8026 "Sun Man". However, this was not purely solar powered because the calculator used rechargeable batteries and the solar cells were on the back of the calculator and were used just to recharge the batteries. The early solar cells were still inefficient. This one requires quite bright light before the display appears and the calculator operates. Soon, with improvements in the technology (and also in the power requirements of the electronics), the size of the solar cells dropped to a fraction of this one. It is interesting to see how the designers have managed to produce a credit card calculator with this large size of solar cell by folding the calculator in the middle. Also see the TEC 205G and IMPERIAL SOLAR-MINI, below, and also the Teal Photon, one of the first solar powered calculators, and the Sharp EL-826, a contemporary calculator to this with a more efficient solar cell. Folded 98 x 67 x 9 mm (3.9" x 2.6" x 0.4"). Open 98 x 130 x 6 mm (3.9" x 5.1" x 0.3"). It appears that one digit of the display is not working. Distinctive features: Early solar cell powered calculators. When folded they have the same footprint as a credit card. 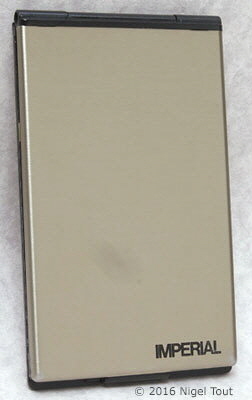 Display is 8 digits (it appears that the Imperial example pictured has one faulty digit), LCD. Folded 63 x 103 x 9 mm (2.5" x 4.1" x 0.4"). Open 63 x 202 x 6 mm (2.5" x 8.0" x 0.3"). Both Adler and Imperial were trade names of T-A Vertriebs-GmbH, a division of Litton Industries. The rear of the Imperial calculator with covers removed. Advertisement, Popular Science, July 1980, p143.